I recently read an excellent article in HFMA by Julian Harris, MD, MBA, and president of CareAllies. entitled “Crafting a comprehensive MACRA strategy- In a time of change in health care, the Medicare Access and CHIP Reauthorization Act of 2015 (MACRA) is one thing that is probably here to stay.” This article gives great insight into the present and future state of MACRA. 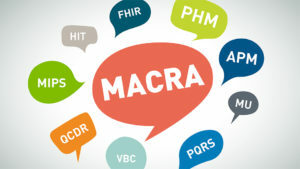 MACRA consists of two pathways: participation in the Merit-based Incentive Payment System (MIPS) and the option to adopt advanced alternative payment models (APMs). Initially most clinicians will fall into the MIPS category, where CMS has a quality score to determine either an annual bonus or payment penalty, as well as an addition to standard fee-for-service payments. MIPS breaks down into four reporting categories, three of which must be reported on in 2017 for payment in 2019: Quality performance, Advancing care information, Clinical practice improvement and Resource use. MIPS is the new standard for how CMS will pay applicable providers—a term that refers not only to physicians who bill Medicare for Part B services but also to physician assistants, nurse practitioners, clinical nurse specialists, and certified registered nurse anesthetists. Only participants in advanced APMs or providers who meet the low-volume exception will be exempt from the program. The advanced APM track makes financial incentives available for physician organizations that participate and have enough revenue or patient thresholds to be considered advanced. From 2019 through 2024, qualified providers will receive a lump-sum bonus payment. Beginning in 2026, qualified providers will receive a higher update to the Physician Fee Schedule than they would have if they were in the MIPS track. APM status is determined by CMS so physician organizations wanting to participate in an advanced APM need the agency’s approval, and if they are not approved, they automatically are placed on the MIPS track. MACRA participation during 2017 determines payment adjustments for 2019. So, providers need to carefully consider their approach to MACRA compliance this year. Through December, physician organizations involved in MIPS can choose to participate in different ways. For example, they can submit measures for less than a year or for an entire year, or they can opt out of the program altogether. But, each approach has payment ramifications. Physician organizations that opt not to participate will receive a 4 percent negative adjustment in 2019. Those that minimally participate, such as by reporting a single quality measure or results from just one improvement activity, will not receive a bonus or a penalty, resulting in a neutral financial effect. However, those physician organizations that submit the required measures for 90 days will receive a small bonus, and those that submit for a full year will receive an even more substantial payment. MACRA went into effect on Jan. 1, 2017, but most physician organizations are overwhelmed by the depth and breadth of available MACRA information, causing them to be unsure of where to begin their compliance efforts. Also, many providers and leaders think that MACRA will not affect them until 2019; not realizing that the reporting period for payments in 2019 has already begun. After 2017, payments will be based on a physician organization’s performance and not just its reporting. Eventually both bonus opportunities and potential negative adjustments are set to grow larger, making having a solid MACRA strategy more important for physician organizations. Now that we have reviewed the tip of the MACRA iceberg and what needs to occur in 2017, my next article will cover Julian’s strategies for launching or advancing a MACRA program into the future.